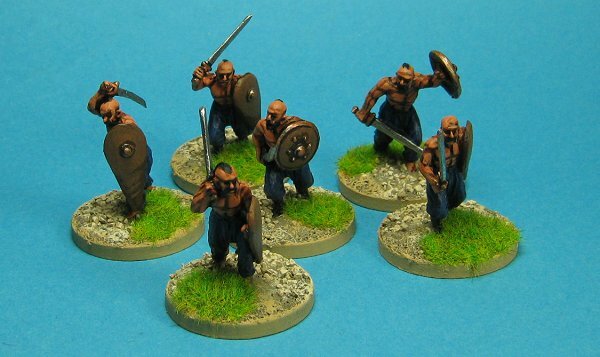 It's been twelve years or so since I've painted a fantasy miniature for a fantasy setting (I've painted a few for sci fi and horror games) but for some reason the need to do some Conan styled miniatures has come upon me. 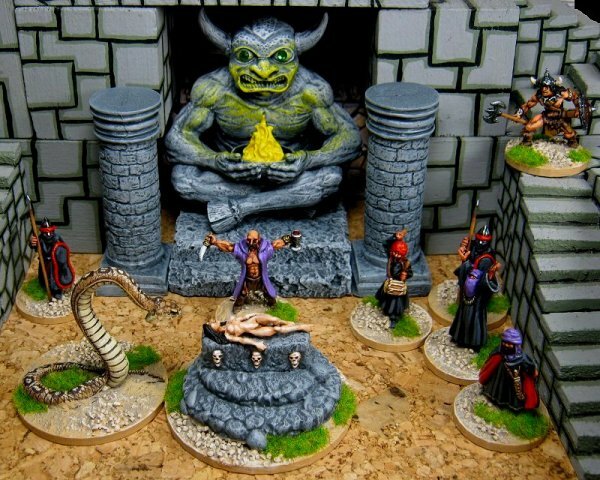 I'm not sure how long this urge will last so I'm planning on producing a few heroes, helpers, antagonists and scenery items for some umpire led skirmish games. 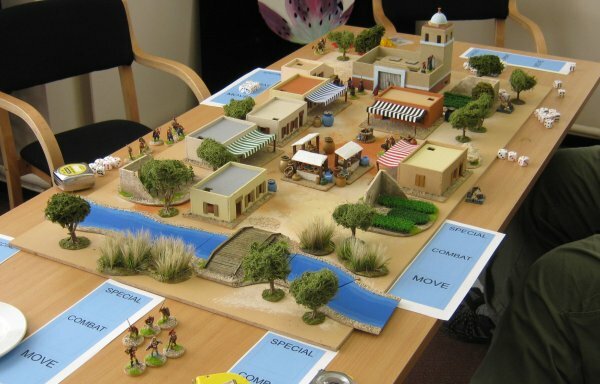 A kind of rpg without all the extras. Hopefully this will all be possible before I remember why I gave up doing fantasy stuff in the first place and stop. I'm currently sketching out some rules and these, if they amount to anything, will be appended later. 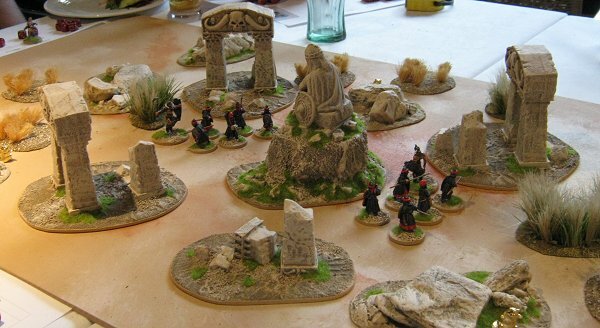 The first miniatures are of Conan himself and an evil wizard, Thulsa Doom probably, from Bronze Age Miniatures. 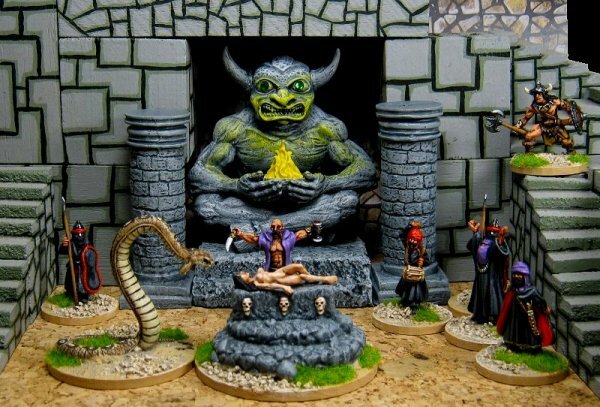 The wizard's victim and the altar are also from Bronze Age. 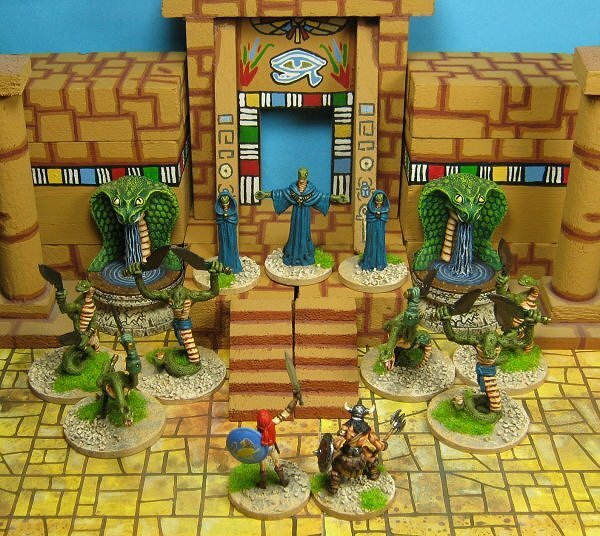 The guards are Moors from Gripping Beast, the snake is from Rafm and the idol is a wonderful piece from Otherworld Miniatures. The two pillars were made by an old acquaintance and have been waiting too long to get a coat of paint. Here are the main protagonists on their own, this is the initial Bronze Age set I bought on a whim which started all this. 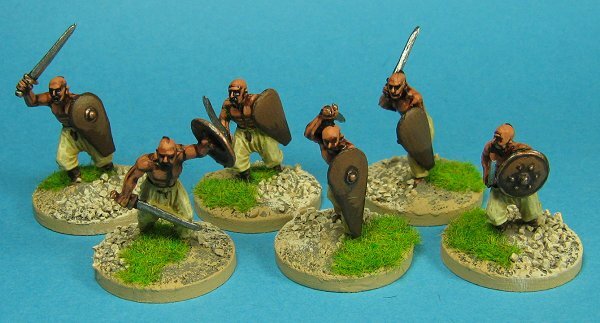 These are Thulsa Doom's henchmen, all from Gripping Beast. 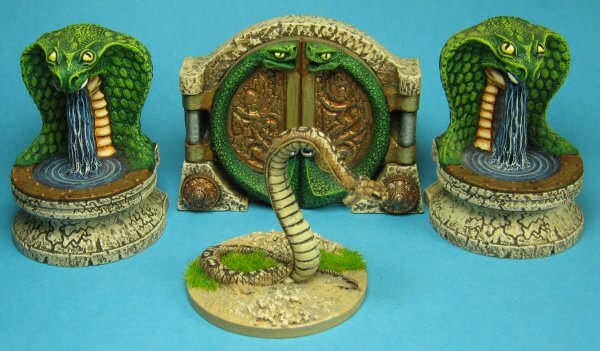 And the Rafm snake with some previously painted Grendel scenery items. 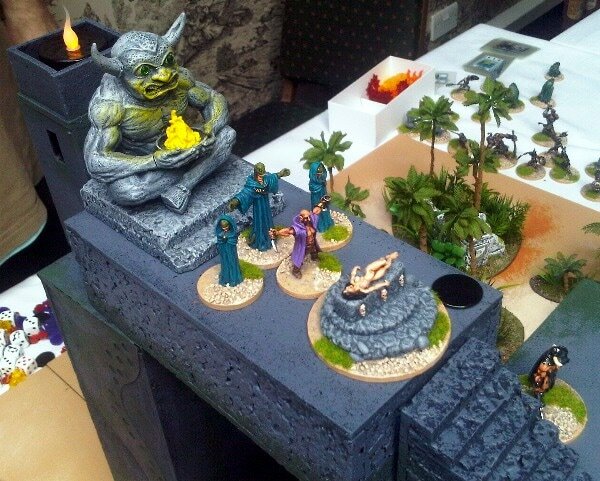 Here's the Otherworld idol and my old friend Peter's pillars. 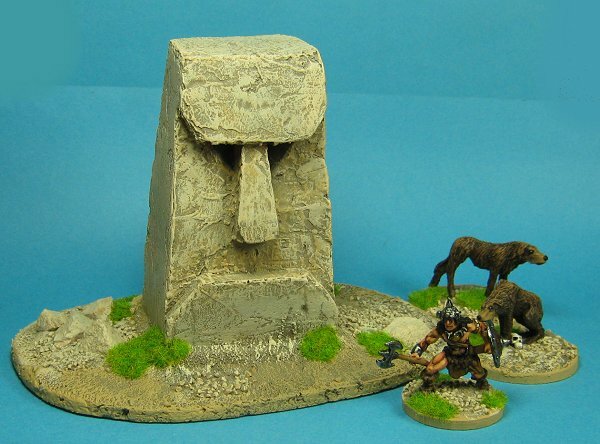 The idol's base is made from cork tile. Red Sonja joins Conan as the first of his allies, she's a Reaper Miniature. 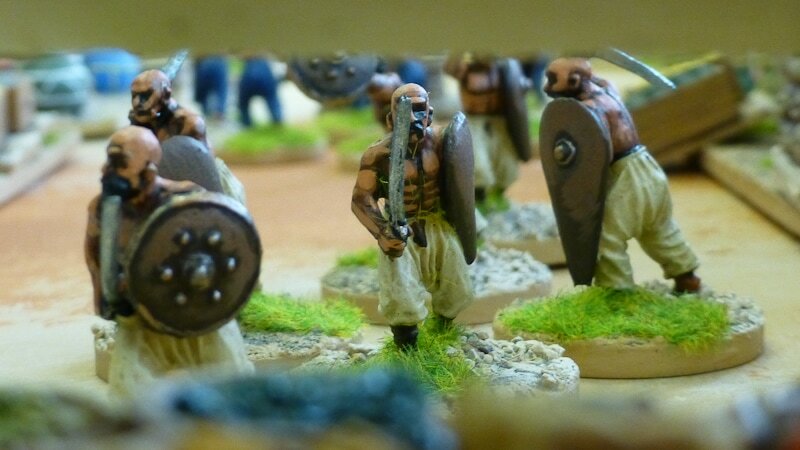 To give them something to fight I've prepared a few Snake people. 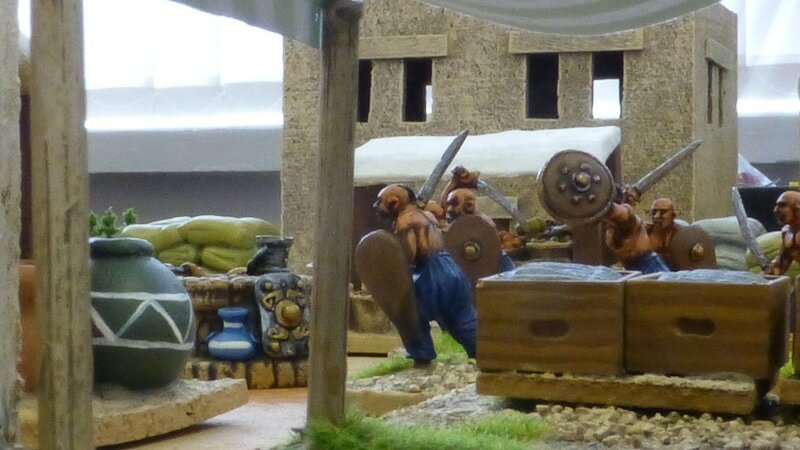 The warriors are Reaper Miniatures again and the priests are from Strange Aeons. 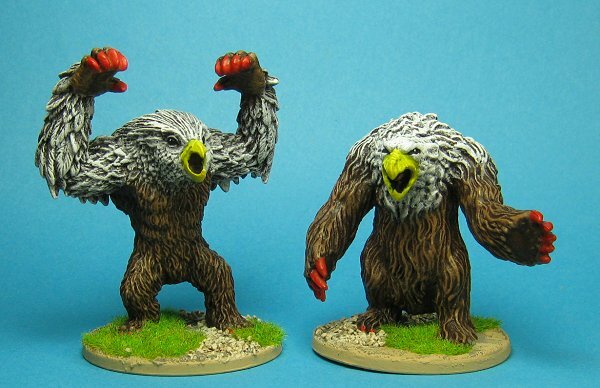 Here are some Gamezone Miniatures harpies bought for my AGON project but just as useful here. 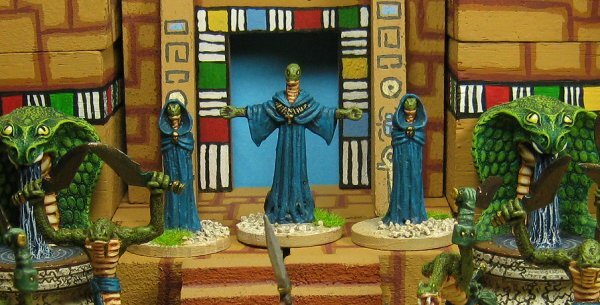 Some evil Fishmen from Strange Aeons. 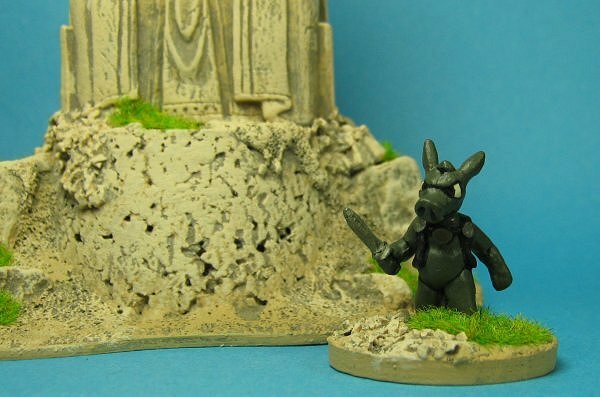 No Conan game would be complete with out Cerebus the Aardvark. This is an unofficial version produced by citadel in the late 1970s. 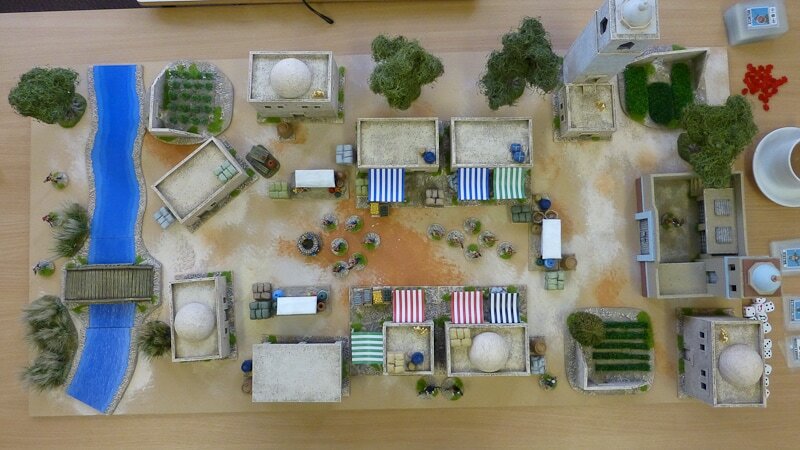 I didn't paint this one, I bought it painted but rebased it to match everything else recently. 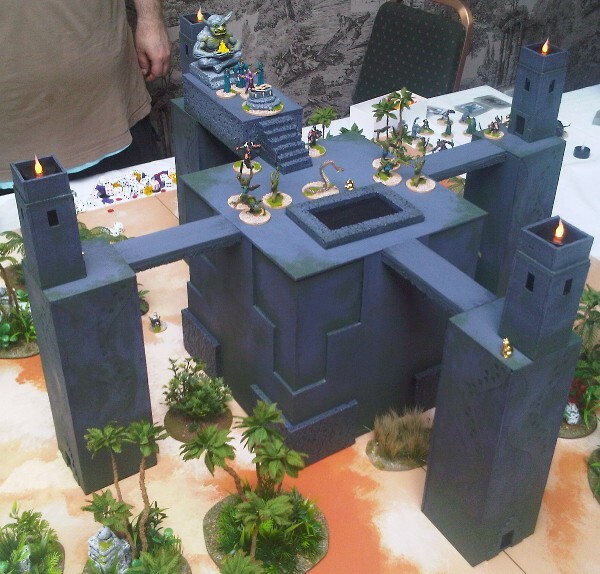 My own version can be seen elsewhere on this site in my Dungeon Blocks article. 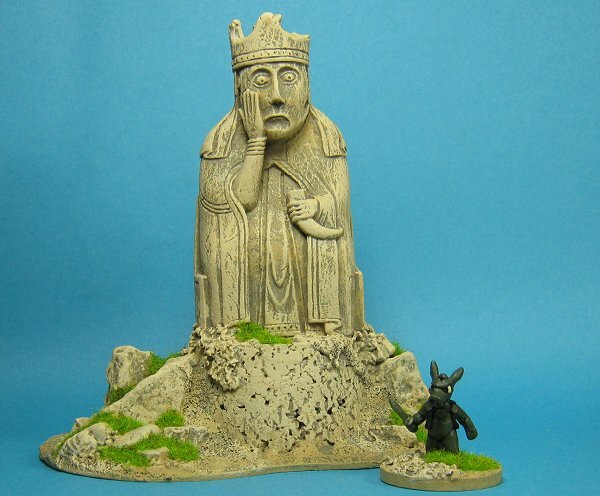 The Woeful Queen statue, originally a chess piece has also had a recent repaint so it matches my current stuff. 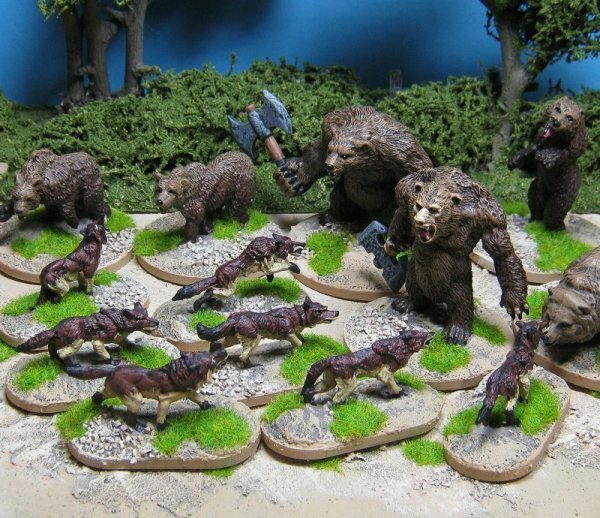 Also, because no game should be without them, Owlbears. 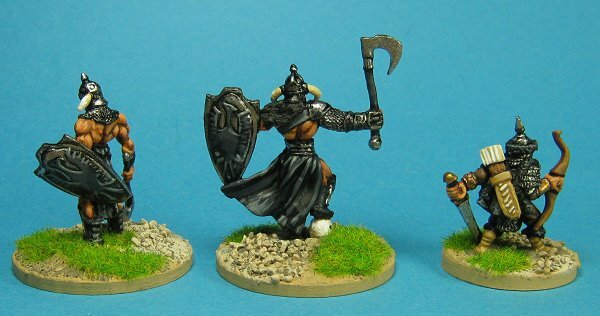 These are both repainted D&D plastic figures. I have named them Thorbjørn and Nielsen since they are clearly of Nordic origin. Here is the start of a caravan, the mounted caravan leader and his guards will be following along soon. 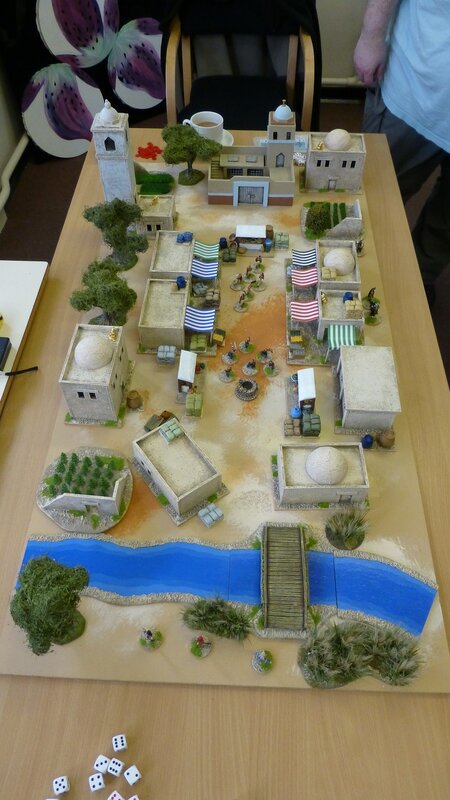 The camels here are from Ellerburn Armies (the three with double loads), Essex Miniatures (the pair of large, light coloured ones) and Dixon Miniatures (the two dromedaries). 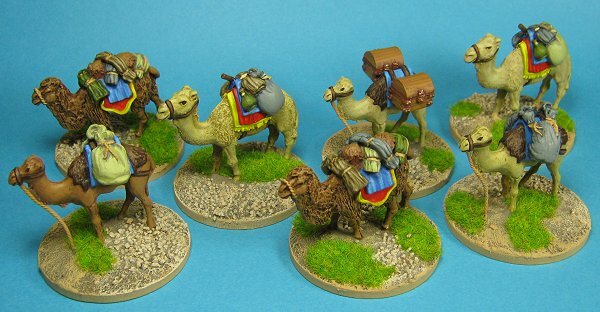 One of the Dixon camels, and I don't know which one, was my oldest unpainted miniature. I bought him in 1979 and he has survived numerous old figure purges to finally get the coat of paint he deserves in August 2011. 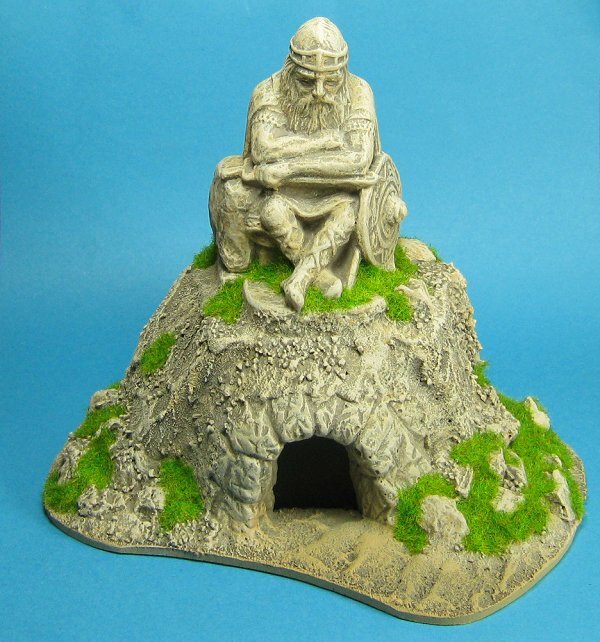 I don't think Dixon even produce this figure any more (they don't). Personally I think it was worth the wait he's a lovely figure. 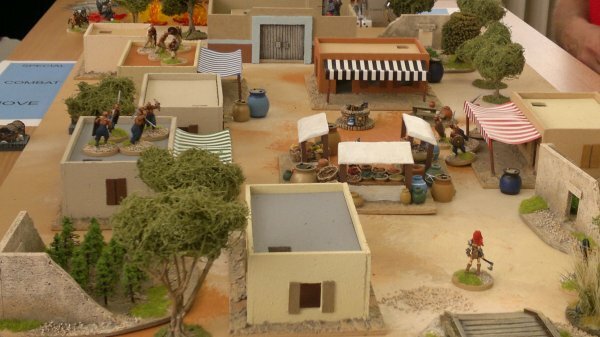 Here are some bandits from Perry Miniatures. These will attack the caravan no doubt once their friends arrive. Next up, what Frazetta themed setting would be complete without a Death Dealer? 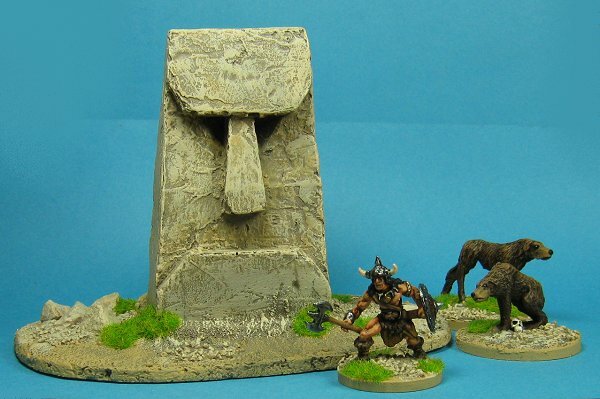 Here are two given to me by David Soderquist from Bronze Age Miniatures and an old Citadel eastern archer as Subotai. I've added cards for these in the cards section. 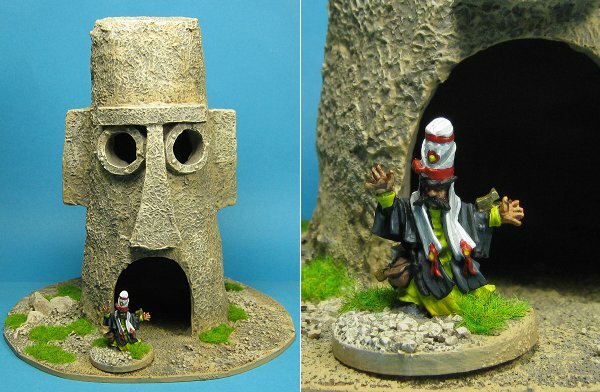 More scenery, this time a wonderfully characterful stone head from Evil Mushroom Games. 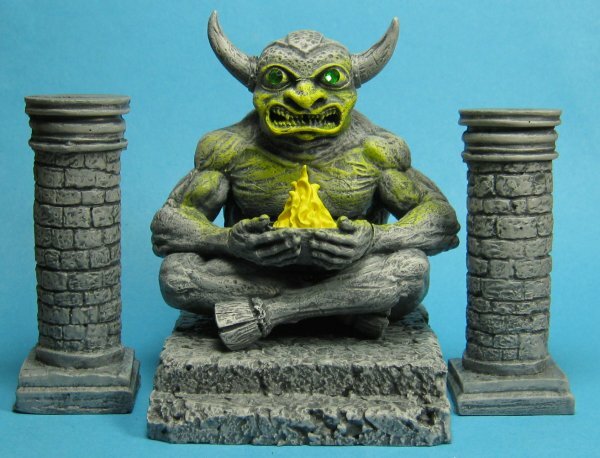 It might even be a representation of Crom himself. 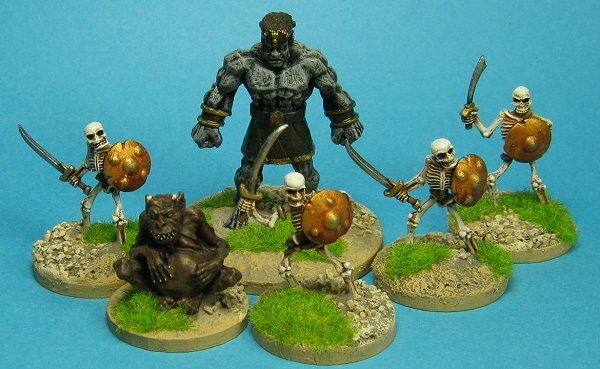 Here are some random antagonists; a Reaper stone golem and skeletons and a Ral Partha demon/imp. 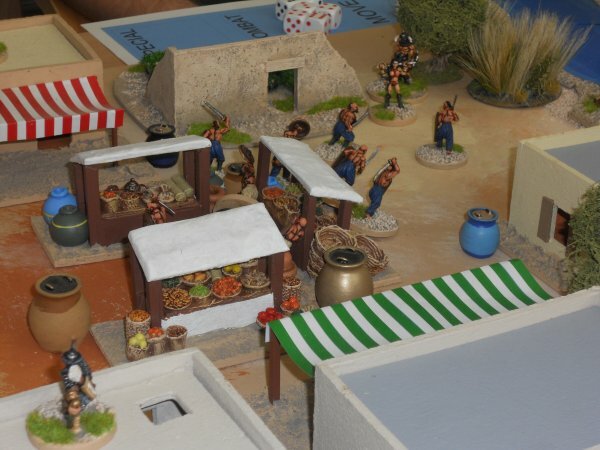 A second group of Perry's bandits. 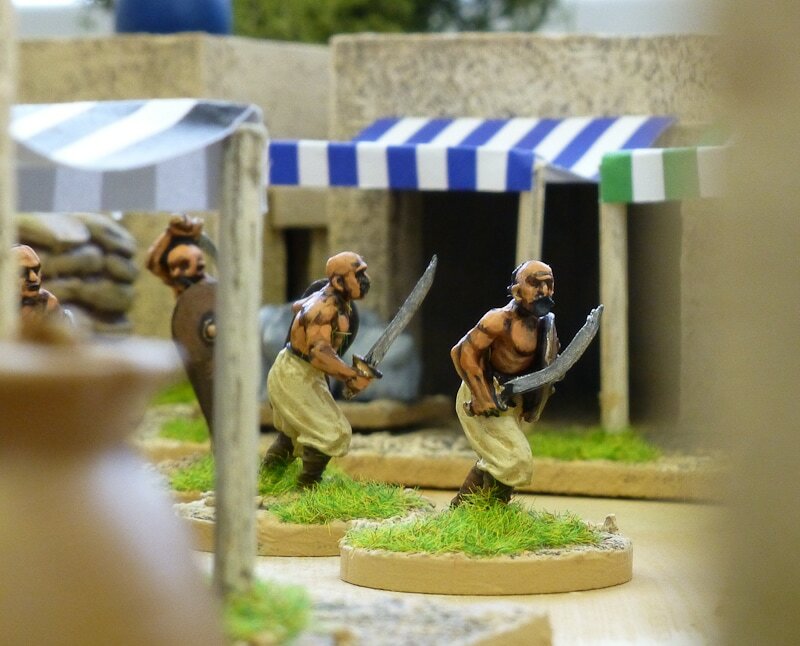 More Perry figures, this time the leader of my caravan and his two sons. 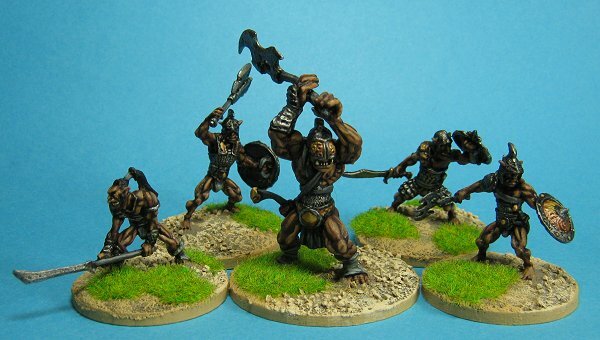 These are orcs and ogres from Bronze Age Miniatures. 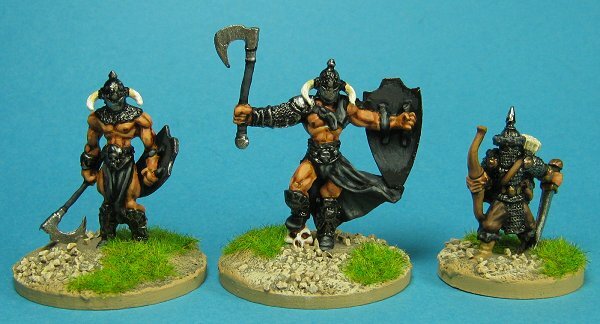 Not many orcs in Conan's world but plenty of bestial half-men and, since these are based on a Frazetta sketch, I decided to use them. 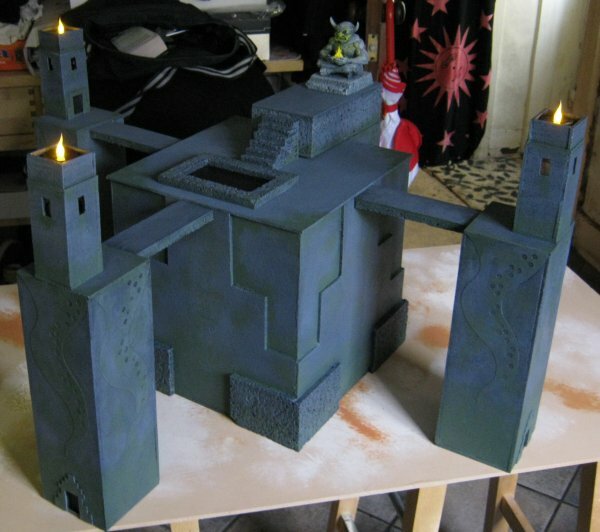 Inside are the remains of King Kull holding his Atlantean sword, ripe for the taking. So long as you can get past the guards. 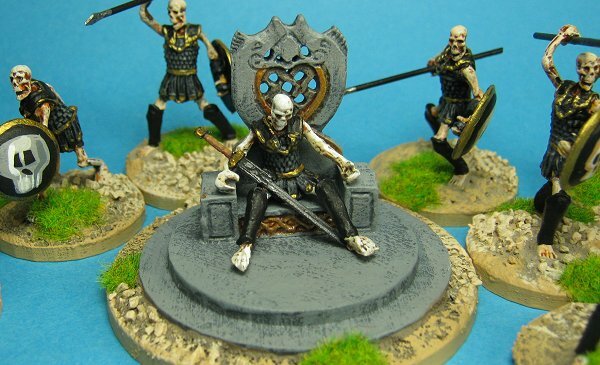 All these are Bronze Age miniatures (the skeletons are mainly intended for my AGON project but they fit nicely here too). 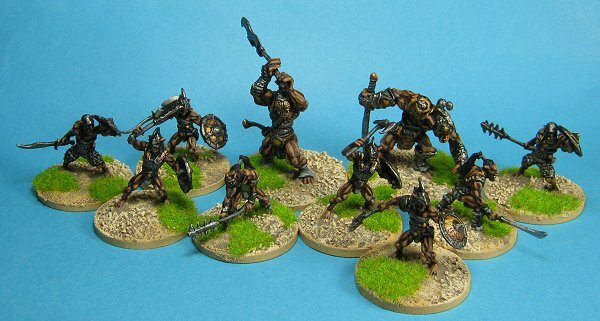 Next up, more Bronze Age Miniatures, this time the women of Conan's world. From left to right, Red Sonja, Bêlit and Valeria. 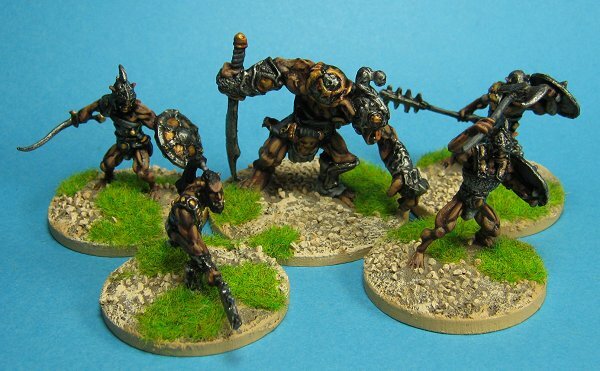 Some grey apes from Obelisk Miniatures, (no longer) available in the UK from Black Cat Bases. 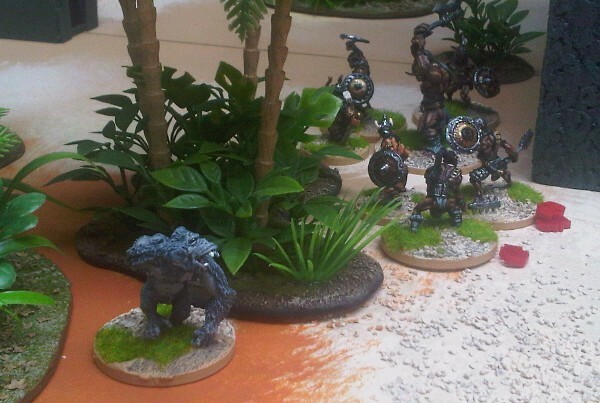 These are on 40mm bases and are pretty chunky beasts. 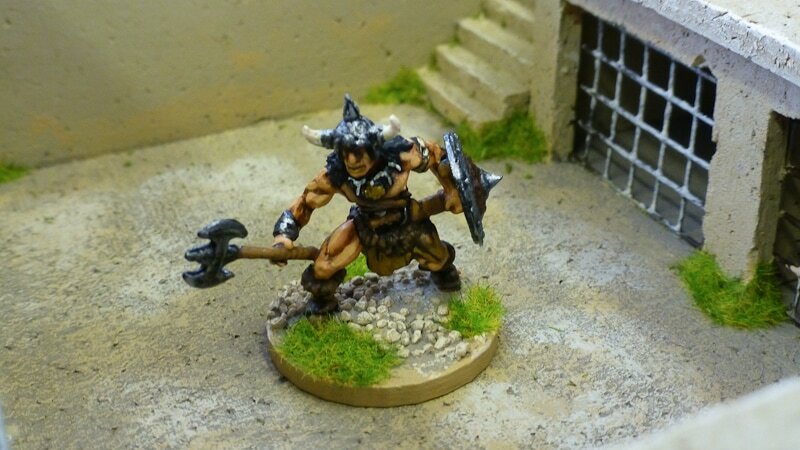 Here is Mako (a Reaper figure) to add some much needed magic to Conan's side. His house is a Spongebob aquarium piece which I thought suited him. 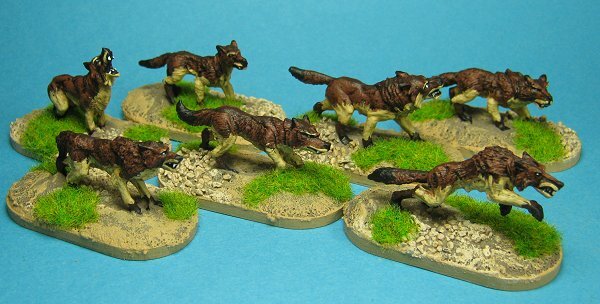 I thought I needed some wolves, you really need wolves in a Conan game. 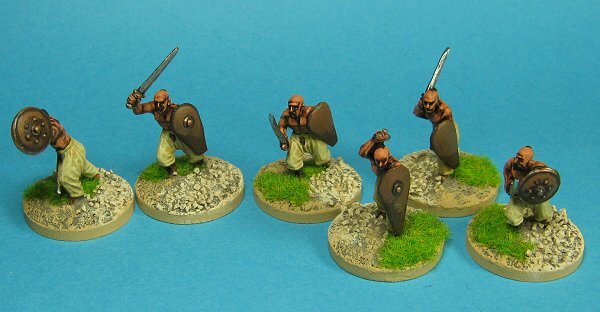 These are old Ral Partha ones, lovely sculpts and pretty cheap too.